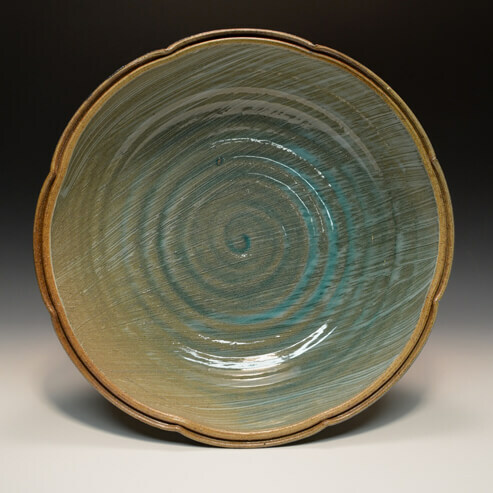 Steve Theberge is a potter from western Massachusetts. He completed a two year apprenticeship with Mark Shapiro at Stonepool Pottery and has trained at Haystack Mountain School of Crafts. In addition to his work as a studio potter, he works and teaches at Snow Farm: The New England Craft Program. I am primarily concerned with how ceramic objects can help us celebrate moments of connection, sustenance, and mystery. My current work is very much informed by the simple tools and labor intensive processes that I have chosen-working slowly on a treadle wheel, mixing clay and glazes by hand, and firing a large wood kiln with the community of potters that I am blessed to be surrounded by. I deeply value this approach to work, both for it’s aesthetic results and for the strong relationships it demands. I make one piece at a time, and try to place equal emphasis on process and on my state of mind. Grateful for the boundaries that a commitment to function demands, I hope that my work will be put into daily service on the table, shelf, or altar.